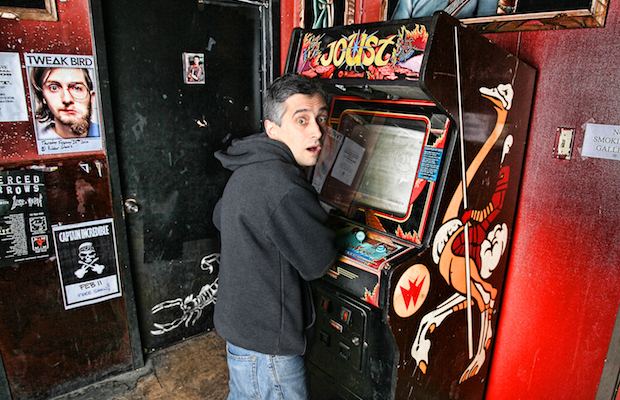 Best known for founding and co-fronting seminal Philadelphia punk group The Dead Milkmen, eclectic punk pioneer Joe Jack Talcum has been even more prolific in his solo work over the last several decades, largely opting to self-record and self-release tapes throughout the ’80s and ’90s, while also taking part in other projects like The Low Budgets. After their initial split in ’95, the Milkmen returned briefly in 2004, before mounting a proper reunion in 2008, and have stayed sporadically active since, allowing plenty of time for Talcum to continue with his solo endeavorers, even if it’s been a few years since his last proper release. The acclaimed rocker is currently on the road for a solo acoustic tour, performing original cuts and Dead Milkmen classics, and, true to his roots, he’s largely playing bars, dives, and DIY spots across the nation, which includes a stop tonight, March 20 at Nashville’s own Fond Object. The all ages, low cost, backyard party also features locals Josh Gray and Carter Routh, and, like Tommy Stinson’s outing a few months back (in addition to countless other epic Fond Object events), it’s one of the coolest ways imaginable to catch a certifiable punk legend! Joe Jack Talcum, Josh Gray, and Carter Routh will perform tonight, March 20 at Fond Object. The show is all ages, begins at 7 p.m., and admission is $7.